(TORONTO) – Canadian drivers of distinction know: the Lexus SC430 luxury hardtop convertible coupe turns heads as it spoils the driver in style. Sculpted from the wheels up to evoke a rush of desire, the SC430 delivers on its promise, with remarkable power, handling and control, safety, convenience and luxury features. With new colours and interior finishes unique to the 2009 model year, the SC430 makes a bold statement that’s distinctly Lexus, whether in the driveway or on the open road. Best of all, the 2009 Lexus SC430’s hard top power roof deploys or disappears silently in just 25 seconds. There are no latches, no snaps, no covers – in short, no fiddling. Just press a button, sit back and enjoy the show. And special attention to the SC430’s design – from the angle of the windshield, to the height of the cockpit cowling, to the position of the rear seat wind deflector – means that drafts are minimized, so driving with the top down is a pleasure. For 2009, the Lexus SC430 is beautifully equipped, and includes an inspired suite of performance, handling, safety, comfort and convenience features. For something extra special, Canadians may opt for the 2009 Lexus SC430 Pebble Beach Edition, which features an exclusive exterior colour, exclusive interior leather colour and wood trim, unique machine tourmaline wheels, Pebble Beach Edition badges, and Pebble Beach gift. The 2009 Lexus SC430 is available in one beautifully-designed model, sculpted with great attention to both form and proportion. A unique shoulder line runs the length of the vehicle, lending the SC430 its sleek yet curvaceous shape. Those desiring a little something extra can opt for the 2009 SC430 Pebble Beach Edition, which features an exclusive exterior colour (Mercury Metallic), exclusive interior leather colour (Ecru) and wood trim (Dark Grey Bird’s Eye Maple), unique machine tourmaline wheels, Pebble Beach Edition badges, and an extra special Pebble Beach gift. 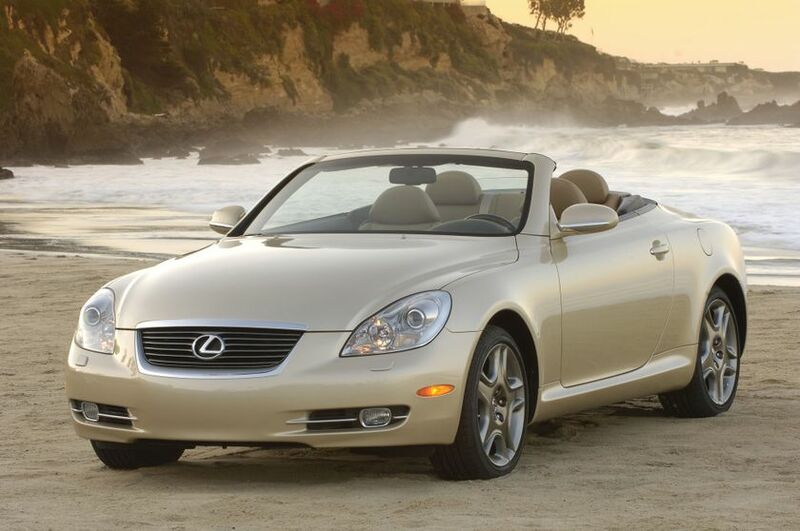 The Lexus SC430 is more than a beautiful convertible. With a commanding 4.3-litre V8 that can generate an impressive 288 horsepower, mated to a slick six-speed super electronically controlled transmission with sequential multi-mode shifter, the SC430 embodies the very essence of exhiliration – top up or top down. There’s no better test for a sport coupe convertible than driving under the open sky on a twisty racecourse, and it’s here that the rear-wheel-drive Lexus SC430’s many handling and control technologies shine like the sun. From Vehicle Stability Control and Traction Control, to front and rear double-wishbone suspensions fitted with gas shock absorbers, coil springs, stabilizer bars and anti-vibration sub-frames, the SC430 is built for maximum control when pushed to the limits. Special anti-dive and anti-squat geometry built into the front suspension work in concert with the progressive-rate rack and pinion power steering to keep the SC430 on the straight and narrow. The 2009 Lexus SC430 incorporates many active and passive safety systems to help protect driver and passengers. In addition to VSC, TRAC and other active handling and control design decisions, the SC430 features a tire-pressure monitoring system, substantial 18” run-flat summer performance radial tires and a generous suite of braking systems. These include power assisted front ventilated disc and rear disc brakes, enhanced with the Lexus Antilock Braking System (ABS), Brake Assist (BA) and Electronic Brake Force Distribution (EBD) as standard equipment. Safety starts with seeing, and the SC430 is standard equipped with high-intensity discharge halogen headlamps enhanced with the Lexus Adaptive Front Lighting System, an auto-levelling system and headlamp washers. Fog lamps are also standard equipment, to provide better lighting in low visibility conditions. Inside the SC430, standard safety systems include a six-airbag supplemental restraint system, featuring driver and front passenger airbags and knee airbags and front seat mounted side airbags. Three-point lap and shoulder seatbelts are fitted in all four passenger positions, and include front seatbelt pre-tensioners and force limiters. And because safety is important even when the SC430 is parked, all models are also equipped with an anti-theft system, engine immobilizer and on-board first-aid kit. Buyers may personalize their 2009 Lexus SC430 luxury hardtop convertible coupe on the Lexus of Canada web site (www.lexus.ca) or by visiting any Lexus Dealer across Canada. Buyers of any 2009 Lexus SC430 enjoy the peace of mind that comes with the industry-leading Lexus comprehensive warranty that covers the entire vehicle for four years/80,000 kilometres. Power train components are covered for six years/110,000 kilometres, major emission control components are covered for eight years/130,000 kilometres and corrosion perforation for six years with unlimited distance. Service adjustments - minor repairs not usually associated with the replacement of parts - are fully covered for one year/32,000 kilometres, while Lexus owners also enjoy the Tire Road Hazard Protection warranty and access to alternate transportation. The purchase of a new SC430 also includes free membership in Club Lexus, an online convenience service that places important vehicle ownership information at the guest’s fingertips. Includes: Unique 18” machine tourmaline wheels; Exclusive interior leather colour (Ecru with Black/Blue stitching); Dark grey birds-eye maple wood trim; White illuminated “Lexus” scuff plates; Pebble Beach Edition floor mats; Pebble Beach exterior and interior badges; Pebble Beach gift set. Features: Aluminum alloy block; Dual overhead cams; 32 valves; Variable Valve Timing with intelligence (VVT-i); Sequential multi-port electronic fuel injection; Direct injection system with dual knock sensors; Electronic Throttle Control System with intelligence (ETCS-i); Acoustic Control Induction System (ACIS); Stainless steel exhaust system. Emissions rating: Tier 2, Bin 8. Fuel efficiency: 12.9 L/100km city; 8.8 L/100km highway; 11.0 L/100km combined. The Lexus Antilock Braking System (ABS) uses sensors to monitor speed, traction, vehicle load and the driver’s applied brake force. The ABS then controls brake applications to minimize wheel lock-up, reducing the chance of the vehicle skidding. The result is shorter stopping distances on wet, gravelly, sandy or other surfaces where traction is questionable.